Submitted by Obbeh on May 17, 2008 - 4:28am. Submitted by benBear on January 16, 2009 - 7:44pm. Submitted by ZekeStaright on March 11, 2009 - 7:02am. Submitted by fabbelabben on December 11, 2009 - 3:46pm. It's not a South Park reference, it's a meme. Anywayz... So "PROF" is short for Profit? Submitted by MyDegeneration on May 7, 2010 - 9:13pm. A meme that started from South Park. Submitted by anarchyfever on January 3, 2010 - 10:18am. yeah, I remember a friend talking about how once liquid goes past a bend its all faith. Submitted by Hughbert on January 7, 2010 - 5:43am. 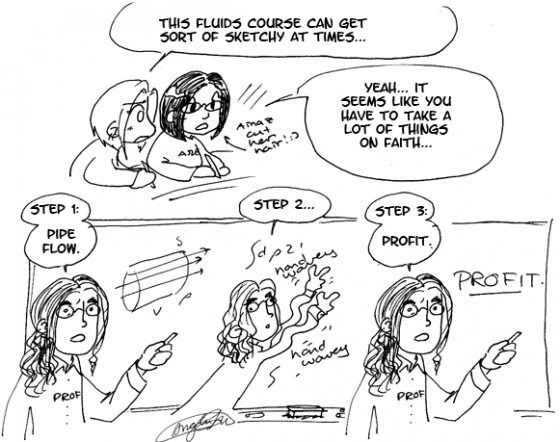 If you replace the pipe flow in the first panel with the Navier-Stokes equations this also works for Computational Fluid Dynamics (which unfortunately I'm now revising). Submitted by Maria E. on January 29, 2010 - 8:50pm.